iancanton wrote: as i understand it, a virtual map is really the dashboard display for a tournament, rather than being a playable map. if judging it by the standards of a traditional map, then i'd have to say that the image is too big, resulting in unnecessary scrolling. the only continent map that isn't of a continent is eurasia mini. far east is a more logical fit, although it's uglier. it also looks strange that central america is pink and mexico is yellow, as i'd expect the three north american countries to be in the same group. the one thing that makes the tournament potentially unfair is the taxes square, which can grossly distort the tournament result by giving potentially the highest reward of all to someone who does nothing more than roll lucky dice (and this is not part of the original board game). why not introduce an element of merit, such as having to earn the money by winning a game on a map of the player's choice? having said all of the above, the strength of this tournament concept and the quality of the artwork clearly qualify conqueropoly for the main foundry workshop. Hello Iancanton and thank you for taking time to see it. 1/Indeed, I need to move pawns and update credits and territories each turn of any team (so really often!). 2/About the size I'm wondering wich size is better. I need player can see the board properly (on both computer and tablet) but I don't want to make it too big. What could be the perfect size into a thread?. 4/So right!!! Sharped eyes! I changed it into the V4 and also move a few territs into the same color group. 5/About the taxes, I changed rules and updated to the V4. Now the only way to get the taxes is to win Poker Club! No more lucky event! 6/ Thank you so much for that. What is the logo '3rd party hosting' for? 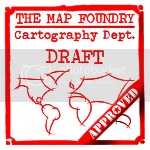 I gonna look into the mapfoundry and I'll try to found some answers. Does that apply for a virtual map? Regarding the size, here are 3 'options', what do you think is best? Is the 17" is big enough for reading all? Fits my screen perfectly. On Pi-School we used 800 and 600 pixels. Yours might be different. HitRed wrote: Fits my screen perfectly. On Pi-School we used 800 and 600 pixels. Yours might be different. You mean the bigger one or the 17"? I thought the 15" was too small. Are you able to read all rules with that size? the 17" version is easily readable (or u can make it so with only a few changes). however, as u have discovered in making the 15" version, u cannot scale down the font so much and still make it readable. however, there are other things u can do to redesign the board in addition to increasing the font size and reducing the size of the colour group squares. the main difficulty arises from the original pentagonal plan which, when translated into a rectangular layout, results in a crooked path instead of a square one. it simply doesn't look as good. i suggest removing two colour groups (such as brown and light green), one continent and one railway. by doing this, the tournament remains equally enjoyable, while it's easier to plan, draw and view, as the path will be square and 800x800 leaves more space for instructions. unlike for a traditional map, u'll be pleased to hear that having a small image of 600x600 will not be needed, since the board is used by the players only for planning and they won't be making their own moves directly in real time. the change to poker club sounds good. who is the player's opponent? u've noticed that the foundry stamp images are hosted by photobucket, which is refusing to show images used by forums such as conquer club unless the account holder pays a fee. the foundry needs to change its stamps, but this does not affect u! iancanton wrote: the 17" version is easily readable (or u can make it so with only a few changes). however, as u have discovered in making the 15" version, u cannot scale down the font so much and still make it readable. however, there are other things u can do to redesign the board in addition to increasing the font size and reducing the size of the colour group squares. Hello Ian and thanks for those advices. Sorry for the delay I wanted to think about your comments. 1/ Ok so I gonna use the 17" but I wanted to be sure before making any change or modification. 2/ I know, and I thought about it since the first version. But I really wanted to have those 5 'continents', also because in a tourney we need at least 8 teams. And a 40 squares board won't be large enough. And I hope in the future, this board will be played by 10 or 12 teams. Will be funnier! But the test tournament will answer most of those questions. 3/Ok. No 600x600 for this virtual map. 4/ It'll be random from all players! And, is there any chance you gonna participate with one of your teamate in this tournament. I'm sure you gonna give good advices while playing. I gonna make some change before the tournament start on this board to make it nicer. DJENRE wrote: And, is there any chance you gonna participate with one of your teamate in this tournament. I'm sure you gonna give good advices while playing. i very rarely participate in tournaments because they take too long! however, i'm happy to follow its progress in the tournament thread after it starts, as an observer. let me play a hypothetical turn. it's round 1 and i'm in team 1. we roll double-6, so land on the hong kong square and choose to pay 1 credit to buy it. still in round 1, we roll double-3, which means we move from hong kong to jail. we have 9 credits and the bank has 1 credit, while all other teams have 10 credits each. is this all correct? incidentally, the usual term in english for two identical dice is doubles, not pair dice. how do u eliminate an opponent? - Love the name, Love the concept! Hope to see/play it soon! how can I join this game? jnl1234 wrote: how can I join this game? As a head-up, the tournament is playing but we have different issues on the way we play the board. I'm still looking for any help if somebody can show me a better solution to work this kind of virtual board, while keeping a nice and enjoyable design!